2016 was an exciting year for me in many ways. The biggest event to occur was undergoing laser eye surgery with Optilase* in early October. Still to this day, just under four months later, I'm in disbelief that I have immaculate eyesight - minus glasses. Laser eye surgery was one of the best things I've ever done for myself, which sounds wholly cliché and dramatic but it's the plain and simple truth. It was a scary decision for me to make, as I'll explain in due course but I'm beyond proud of myself for developing the courage to go through with it. I was a glasses-wearer for most of my life so experiencing life minus them, with my own eyes, is a new and exciting experience. I feel like I've been given a new lease of life and sense of freedom. I hope this blog post encourages those thinking about having their eyesight corrected to get it done or that it at least informs those who don't know much about the procedure. My first 'eyesight memory' as such isn't a nice one. It was an occurrence that set the ball rolling for many years to come of optician visits, deteriorating eyesight and a lack of confidence. When I was 2 years old, I was running around the sitting room, hyper as kids are at that age. I ended up running into the arm of a chair where someone was sitting with a lit cigarette in their hand. I landed on the lit cigarette, eye first. I remember little of it personally but I was rushed to hospital where my parents were told that I was lucky it didn't go further into my eye than it had. I wore a bandage patch for weeks, which I vaguely remember. I remember my Mum sellotaping it on and how horrible it felt when my hair caught on to the stickiness. Apart from that, I recall nada. The years went on and my left eye's sight was terrible. I was brought to my Grandparent's trusted optician at around the age of 5 or 6 and I do remember this: I was so terrified of anything going near my eye since the accident, that my Nana and the optician had to physically hold my arms and legs down on to the optician's bed so I could get a simple eyedrop put in. I was prescribed glasses as a child, along with a patch (pictured below) that I had to wear over my right eye, in an attempt to build up the left eye's strength. I despised wearing it and felt mortified anytime I caught a glance of myself in the mirror. Unfortunately the patch did little to boost my left eye's strength so we ditched it. I had a period of wearing no glasses at all from 9-12. I just sucked it up. Until secondary school arrived.. I noticed as each year passed in secondary, that the board would get blurrier and blurrier and I'd have to move a row up constantly to see it. It got to a point where I was developing headaches from squinting so much so we booked an eye appointment in Specsavers. My results were hereditary short-sighted vision developing in my right eye and my left eye was just as banjaxed as ever. 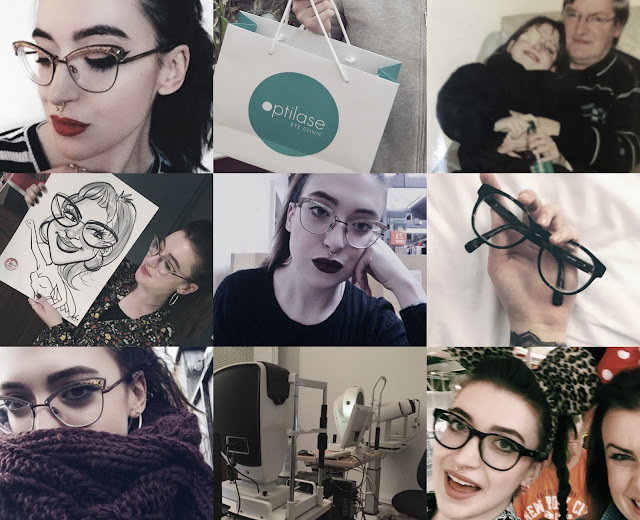 I was prescribed my next pair of glasses at 13 and my eyesight dropped so dramatically as the years went on, I'd sometimes need my lenses changed twice a year, up until the age of around 22, when the changes started to slow down. Fast forward to January 2016. I received an email one morning from the PR team at Optilase enquiring about me undergoing laser eye surgery. Honestly? It hadn't crossed my mind before. My accident meant that for 20 years, I was absolutely petrified of anything going near my eyes - mascara wands, eyelash curlers, water - let alone a laser! Laser eye surgery wasn't even on my mind because I never thought I'd develop the strength to go through with something like it. My Mum talked me into booking a consultation appointment. What harm would it do? It was possibly the biggest opportunity to come through my inbox and it'd be foolish to say no. I attended my first consultation in Optilase's Dublin clinic; I went in terrified and walked out enthusiastic. The staff were extremely patient and knowledgeable. I was given a routine eye check, nothing dissimilar to what you'd get done in an opticians, bar a few new machines. When the laser eye surgery procedure was explained to me in detail, for the first time I really wanted to have it done. No blades were involved (older systems of laser eye surgery can include blades) so that fear was put to rest. After learning how quick the surgery itself would be and how transformative the results were, I was sold and said a big "YES" to going ahead with it. There was a slight complication for me though: because my left eye was so damaged and weak, understandably Optilase weren't confident to go ahead with the surgery immediately. I was instructed to get a new pair of lenses put in my glasses; an updated prescription for my short-sighted right eye and for the first time ever, a strengthening lens for my left eye. Prior to this, opticians never bothered putting a strong lens in for my left eye because it simply wouldn't really improve anything. For laser eye surgery however, it would awaken my eye muscles after 20 years and prepare them for eye sight - post-surgery. If I was to go ahead without the "training" lens so to speak, I could risk developing migraines due to my brain and eye muscles going into shock because of them being inactive for most of my life. October arrived and I had my third check-up appointment since January to keep an eye (had to throw a pun in somewhere) on how my eye muscles were doing. I was told that my eyes were finally ready to go for surgery and that my left eye's muscles were finally back in action after so long. When it comes to laser eye surgery, if you're ready to have it done, you can have it done ASAP. I was offered a date for the next week and took it. I wasn't prepared to build up nerves for weeks on end and I wanted to get it over and done with because I was impatient for eyesight (and still nervous). Prior to your surgery day, it's advised that you wear no eye makeup on the days leading up to it so I wore nothing for the full week beforehand, just in case. I also practised putting eyedrops in daily because I was still incredibly jumpy doing it and I was wasting product. Other than that, I waited patiently for my life to change and happily said farewell to the stack of glasses beside my bed. My surgery was booked for a Friday morning and I was told to eat beforehand, take any of my day-to-day medication and to bring sunglasses (and painkillers if necessary) along to the clinic. The only thing I wasn't allowed was caffeine so I had to skip the usual morning cuppa. My appointment slot was 3 hours but the majority of the time was given to my final eye check up with the surgeon, to make sure everything was perfect, and to prepare myself for the surgery itself. I was offered a relaxant (one Valium) and I happily took it. They're optional to take but I'd highly recommend doing so if you're nervous or in any way anxious. It relaxes your body considerably. I was honestly quite terrified walking into the surgery room, my legs were shaking and I was pretty emotional. I want to say this before I continue and I want anyone out there to remember it, who's considering getting this done: I was PETRIFIED of having anything near my eye or going into my eye. If I can get through laser eye surgery, anybody can. Absolutely anybody. The surgery took a total of 15 minutes (yep, 15 whole minutes). Approximately 7 and a half minutes per eye, with my left eye taking around 20-30 seconds longer. The surgeon and nurses were so calming. They were aware of my nerves due to the accident and were beyond patient with me. Everything was painless. It was just odd. Your eyeballs are numbed with drops and held open (you don't have the urge to blink as your eyes are numb) so you feel no pain. The sensation of the laser and the surgeon is a tad weird (nothing to be scared of, just an unusual experience). The laser correction was similar to some of the machines I was examined with before, just a bit brighter. You're required to look at certain points of the laser machine above you for the laser to correct your eye (hence why you have to be conscious and fully awake for the surgery). I was told to put on my sunglasses immediately and I was collected by my Dad to ensure I arrived safely home. I was given a bag of aftercare instructions, eyedrops and safety goggles and I was ensured that I was to ring the clinic at any time if I was worried about something. Eyedrops were to be taken throughout the day (again, each individual is different) and I made a chart in my notebook for each time I was required to take them. I advise doing a similar chart as you have to take the drops various times throughout the day and it can be hard to keep up. You're booked in for an appointment the next morning after surgery, to make sure everything has gone to plan and no complications have appeared. I advise bringing someone along with you, just in case you're still a bit wobbly with your sunglasses on and not used to your vision so soon after. I wore my sunglasses anytime I stepped outside of the door for the first month, to prevent dryness and anything getting into my eyes. Prior to my surgery, sunglasses worsened my eyesight so it was a completely new experience walking around wearing them and not just for photos. Showering-wise, I wore swimming goggles to protect my eyes from water and product. I wish I could insert a "when I went to the gym" line here but I don't go to the gym. If you do go, you're advised to avoid exercising for a week to avoid sweat entering the eye/ accidents occurring. Physically, my eyes looked terrifying due to bruising. This is completely normal and the red streaks you see below aren't blood (I definitely asked this) but merely the equivalent of bruises on your eyeballs. Yes, you may look demonic like I did for a few weeks but it was worth it and I got over it. I didn't wear eye makeup for over 3 weeks after my surgery, it's advised to not wear any for 2 weeks but to be extra-safe I pushed it out longer. Again, I didn't care too much. My family and friends knew I had undergone the surgery so nobody fainted at the sight of me. Thankfully. I experienced very little discomfort afterwards and I gradually began to enjoy putting eyedrops in because they're extremely soothing for the eyes when healing. My eyes themselves were a tad sensitive to bright lights at night-time but too nothing dramatic at all. Skip on to today, January 2017, four months later and I'm currently writing this blog post without glasses and with (almost) perfect vision. Amazing, eh? I've had several checkups post-surgery and expectedly my left eye is taking a tad longer to heal. (Again, this is in an individual problem because of my accident.) My right eye now has 20/20 vision and my left eye is 80% there. Due to the time of year (darker days, more wind) and the amount of time I spend on my computer (college, work) my eyes took around 2-3 months to heal. (3 months is the average time for most patients but some people can heal within 6 weeks). I can see perfectly, just about, but my left eye is still catching up. It's nothing noticeable until I do eye tests to be honest. Even having sight in my left eye after 20 years is mind blowing to me. Without getting too mushy here, I cannot reiterate enough how life-changing this has been for me. It has given me a new sense of confidence I never thought I'd experience and it's freed me. Being able to see my notes and the screen in college without a lens in front of me is a dream. Sporadic cinema trips are a reality because glasses don't hold me back anymore. Travelling is already a million times better; being able to appreciate architecture and art with your own eyes is truly special. If you're thinking about undergoing laser eye surgery, please, please, PLEASE just go for it. Book a consultation (Optilase's are free) for the new year and be prepared to have your life changed. I never thought in a million years that I'd have the luxury of eyesight back, yet here I am at 23 with it. It's one of the best decisions I've ever made hands down and if I can do it, you can too. Trust me! #ad Disclaimer: I received complimentary laser eye surgery treatment from Optilase in exchange for this blog review and social media mentions. As always, this hasn't affected my review and I've been 110% honest with everything above. Laser eye surgery is the greatest 'perk' to my job that I've received to date over the last 8 years and I will be ever-grateful for the opportunity and immensely thankful to the Optilase team for quite literally changing my life.